Gosh it's been quite awhile since I posted, one thing after another and life in general... I have been working a few pieces of jewelry and a quilt, the jewelry I'm pretty pleased with! 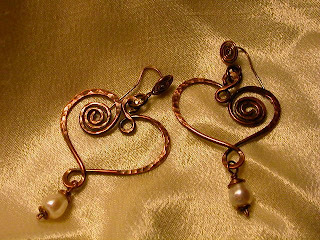 The quilting less so..
A pair of copper wire hammer textured spiral heart earrings with pearls. The inspiration for them was Sherry Dancing Feather who is probably my all time favorite jewelry Heros. I wish wish wish I could someday take a class from her but until I get rich (hystercal laughter) so I can travel to TX. I will have to merely be wistful and emulate her genius. 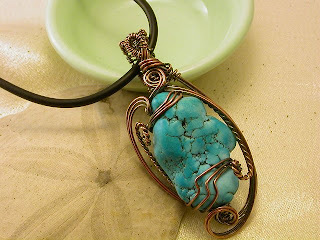 Another piece I completed was this copper wire sculpture pendent with a pretty dyed howlite or magnesite free form cab like nugget... my dear husband brought this back to me from a trip to the Oregon coast when he went with his mom and siblings on a family outing several years ago, I loved the color and just had it laying around until early one morning I picked it up and started wrapping it, it flowed into shape almost unconciously and I think it might be one of my better creations. I wove the bale with 24gauge copper and then tumble hardened, and applied a patina.